Beyond some Technic models proposed on CUUSOO, there are also other AFOL's projects you may support at diverse platforms. Now we have a kind of Technic Baseplate (MinuteBot Base) being proposed by Lasse Mogensen and Soren Jensen, from Denmark. This could become useful as proposed for instance to the construction of robotics based on LEGO MINDSTORMS. It extends a LEGO beam into a rectangular plate with 21 x 30 holes. This is an idea currently running on Kickstarter to raise funding. Kickstarter is a service that utilizes crowdsourcing to raise funds for your creative projects. Kickstarter is a way for entrepreneurs to raise initial funding for their business. For this particular project, the designers need to have a specialized plastic mould specially manufactured for them — which is very expensive. On the other hand, once up and running, the production cost per plate is relatively low. This means that if they know upfront that enough baseplates will be sold, the price per product can be kept low. So, if enough people pre-order the product, production can start. You pre-order the baseplate by making a pledge to the project. This means you support the business, allowing them to purchase the expensive mold and start making baseplates. In return for your support, you get one of the produced baseplates. Note that you only pay once production really starts, so there is no risk for you as the buyer. If funding doesn’t succeed, the project fails, but no money changes hands. In short — To get one of those base plates, pledge (pre-order) to the project here, and you only pay if production starts (and you get the product). Below you can see the Kickstarter video where Lasse explains the whole idea behind this project. The physical dimensions (L x W x H) of a MinuteBot Base are: 240 x 168 x 8 mm. and the weight is estimated to be around 135g. The material is ABS (maybe with some glass fiber added to increase stiffness). The project requires $11.000 pledges to get a Go and there are now still 31 one days left, for this to have a chance. Actually it is already 33% funded, but there are still another 67% waiting for you! Pledge if you would like to have one or more MinuteBot Bases. I agree. It's also easier to make strong constructions if you can put beams through the baseplate. 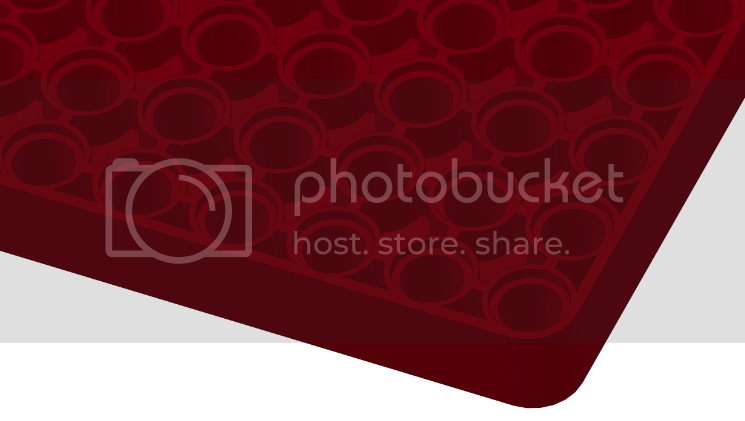 I think the whole idea of this "baseplate" would be lost if no all holes were present. It would lose a lot of its appeal and usefulness. The project certainly has my backing! This idea has my backing more so than any MOC simply because I can already build any MOC with the parts I have. I really do think that the Cuusoo concept is much more appealing when it can bring new parts that we cannot already make ourselves. Having said that, I think it would be harder to get 10,000 votes for only a single part and also remember that reaching 10'000 votes does not mean TLG will make it, it only means they'll think about it. Making a new mold is very expensive and so might put them off. Oh, wait, this isn't even on Cuusoo. What the heck am I talking about? LOL! Rather than simply voting a proposal, Kickstarter is a case of putting your money where your mouth is. If there are is sufficient backing the product gets made. While I feel unlikely that TLG would produce new parts out of CUUSOO, project initiatives like this on Kickstarter may have a better chance. At least for certain types of elements that are not much complex, neither involve a big investment on electronics and development. So how's the money that's collected going to be spent? On new molds and so on? If that's the case, how do those who donated get a return on their investment? Have you visited the project page on Kickstarter? There are different backing options and most include the purchase of one or more items of the product. Of course you are only charged (your backing is made effective) if there is enough backing and the project goes ahead. In that case you also get the amount of product you signed up for. If the project doesn't go ahead you are not charged. It's a win win situation. In most cases (and this will be no exception) the investment doesn't serve to just fund the items for backers, but also future product runs. But normally the price of an item you get by backing the project is better than what you are likely to pay later on. A clear example is Daniele Benedettelli's NXT2WIFI sensor which is offered at a premium 80€ compared to the 100€ announced retail price. Oh I see, sorry I should have looked there first. Well it really does sound like a win win situation, great for getting new parts.